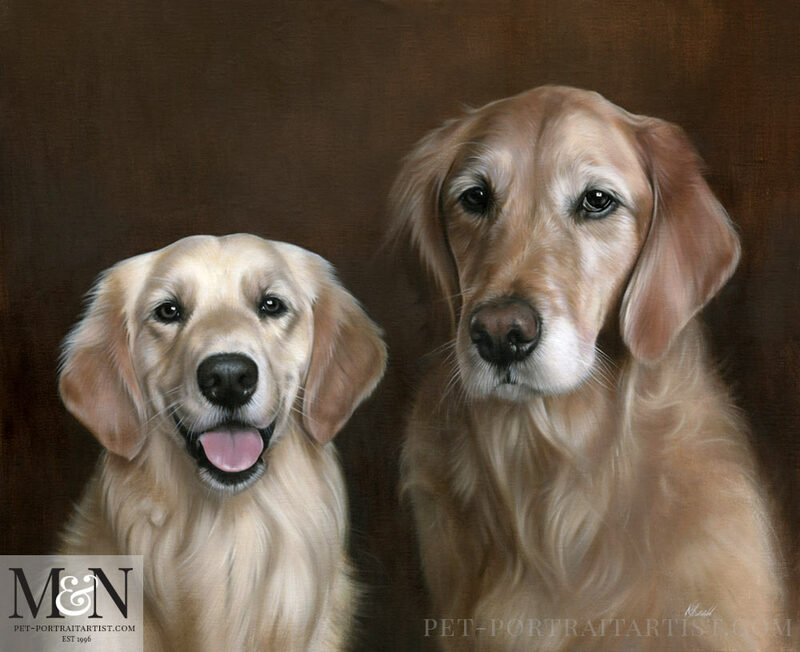 Welcome to our latest Golden Retriever Oil Pet Portrait of Charlie and Eliot. 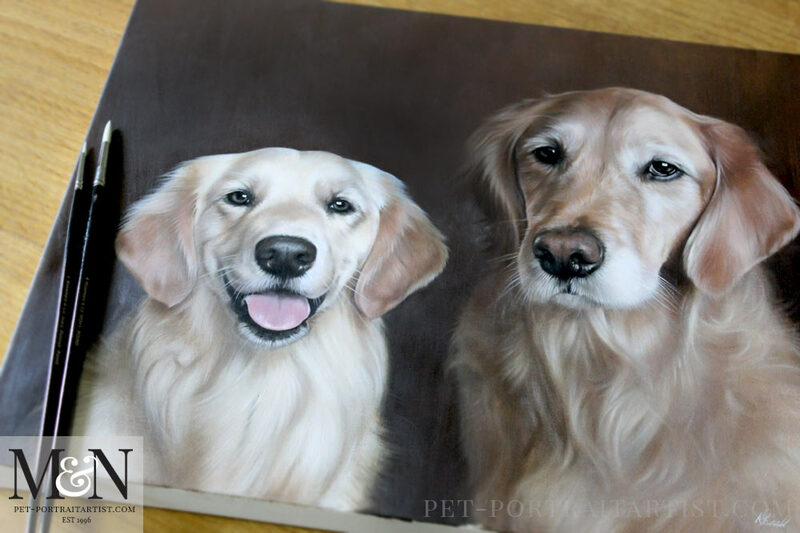 Charlie and Eliot are sisters and they were commissioned by Nicole (USA) at 20 x 16 size. 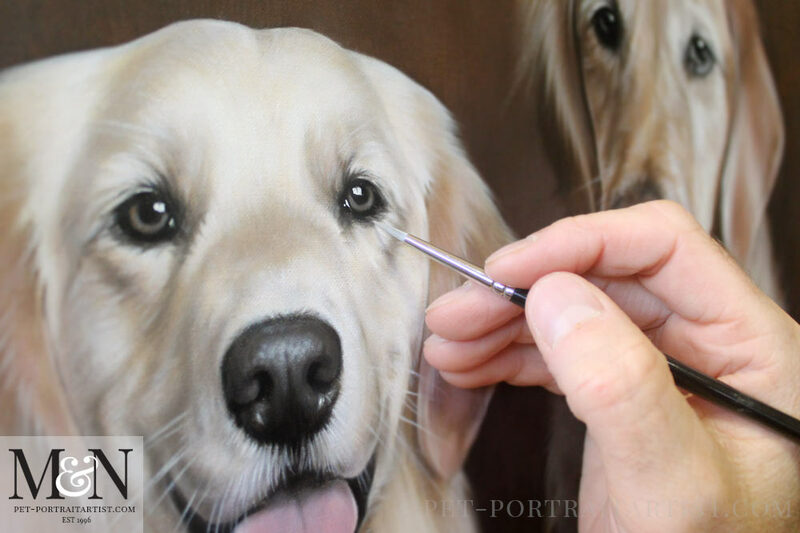 Nicholas traditionally hand painted the portrait in oils on Italian Linen Canvas. Nicole enjoys photography and taking photos of Charlie and Eliot. Why wouldn’t you, they re so gorgeous! 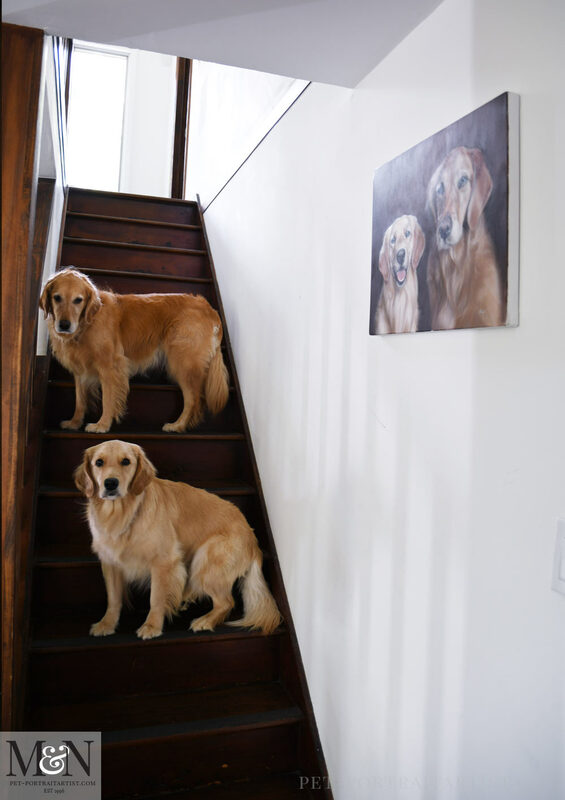 She took photos of both dogs specifically for the portrait which was fantastic for us. 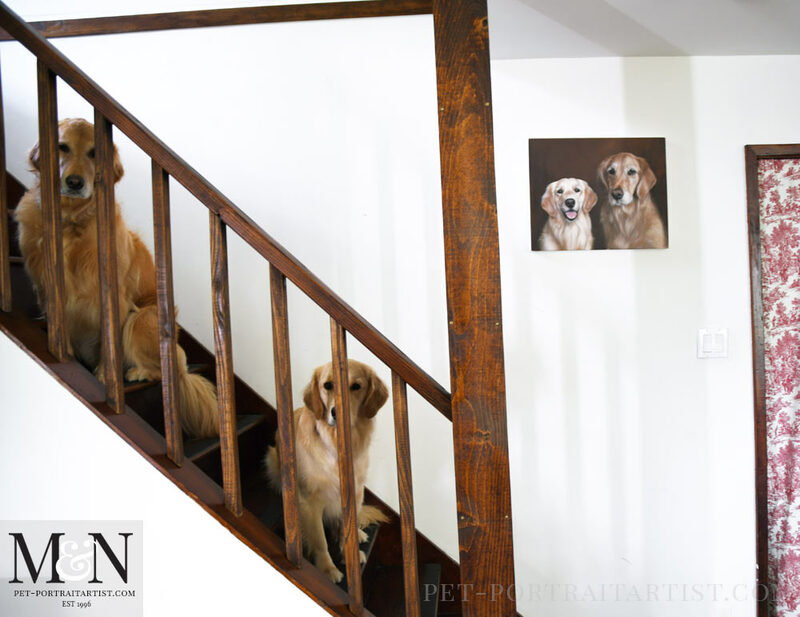 As you can see from the portrait below Nicole opted to have a dark background which really brings out the beautiful rich and warm tones of Charlie and Eliot. 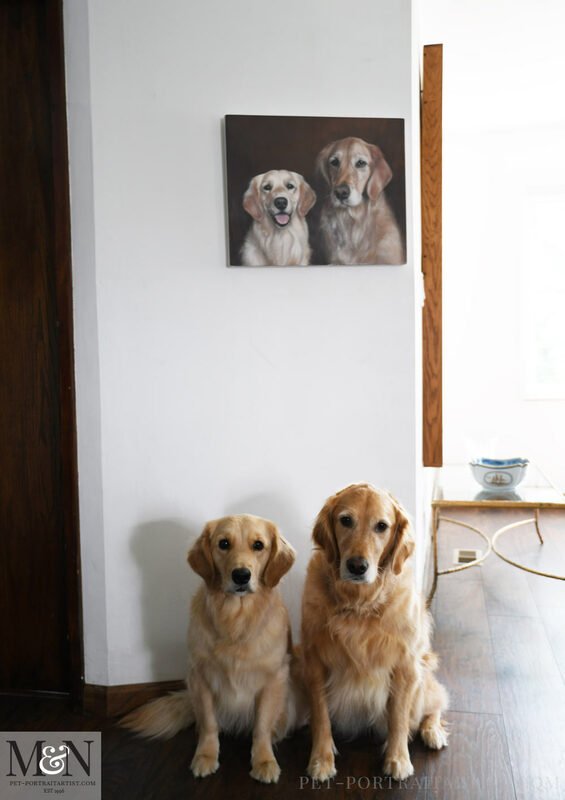 Nicole wanted to match another portrait in her home. A painting of her grandfather and his dog completed many years ago. It also had a dark background and so our painting mirrors this well. Nicole has written blog post about her experiences with us which is absolutely amazing. You can read the full blog post and see the portrait of her grandfather here too. 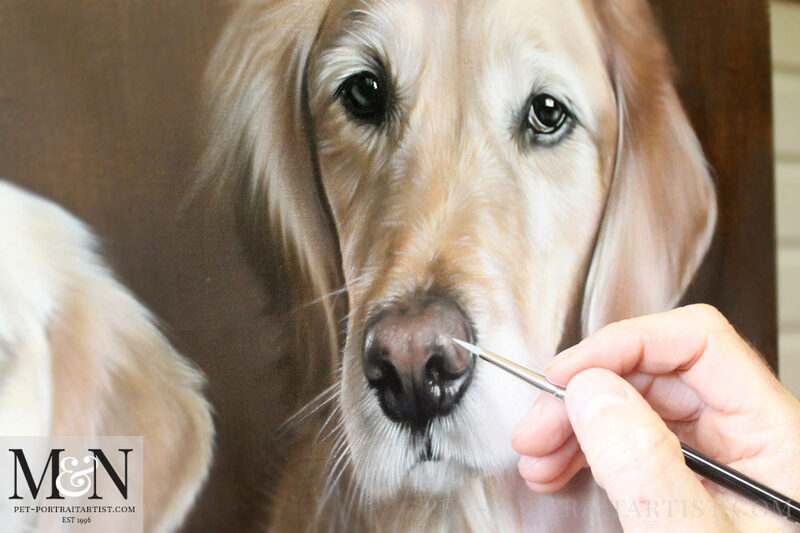 Golden Retriever Oil Pet Portrait – Photos! As usual I took plenty of photos of the portrait on our plan chest to go along with the final scan. It was a very tricky painting to photograph. The light caught the canvas and due to the dark background, however hopefully it will show the painting to its best. As you can see I have also added paintbrushes next to the panting to show the scale. All of our in progress photos are emailed to our clients so that they can feel part of the paintings process. We used to add all of our stages here on the blog, however we found that many of our clients preferred them to be kept private. So we are starting to now add only the end stages with Nicholas had adding the final touches and highlights. So are are a few of Nicholas doing just that. 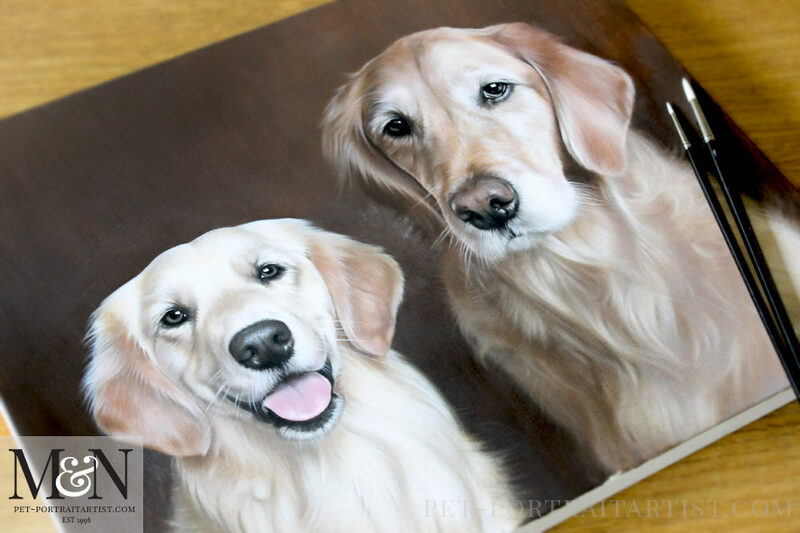 Golden Retriever Oil Pet Portrait – Happy Clients! ……The reality of the process with Melanie and Nicholas was a dream. They were so careful, thoughtful, and responsive along the way. They worked hard to make sure that we knew what we were getting and were going to be happy with it. Melanie and Nicholas collaborated with us on the source material and allowed us to track each step of the creation once it began. There was no opportunity for unwelcome surprises given the diligence of their process. We are so happy with our choice. We wanted the best and that’s what we got with this team…..
Nicoles testimonial is absolutely fantastic. I will be adding the painting to our website in my next round of updates.